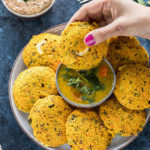 Healthy Rava Idli is a popular Indian breakfast. 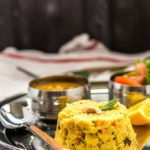 These steamed cakes are made from semolina and served with sambar (lentil soup) and chutney. I always feel super recharged on Monday. Do you feel the same or suffer from Monday blues? I actually get the blues after a long vacation. Like when I came back from India, it was difficult for me to get back to the routine. But the regular weekends, that break is different. I relax during the weekend and then I am all excited for the new week. I think what keeps me going is good breakfast. I never ever miss it. I don’t know how people skip breakfast, I wake up so hungry! 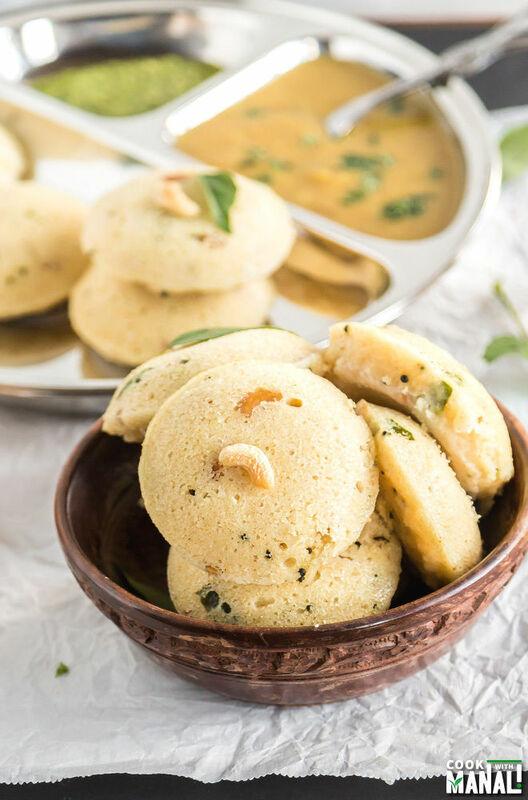 The recipe that I am sharing today is one of the most popular breakfast dishes in India – Idli. I am sharing the version which is made with rava [semolina or as well call it sooji in Hindi] and hence it’s called Rava Idli. Idli is extremely popular all over the country but has it roots in South India. For those of you who have never heard of Idli, it’s basically steamed rice and lentil cake. 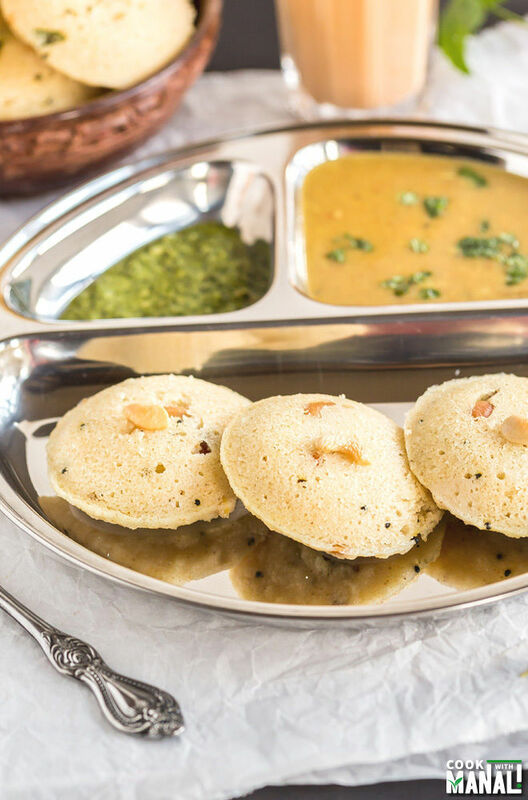 The traditional idli is made by grinding rice and lentil and then fermenting the batter. 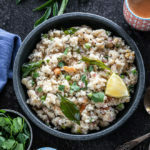 Once the batter ferments, it’s steamed using idli stands and served with sambar (lentil soup) and chutney like coconut chutney or onion tomato chutney. It’s not only healthy but also very delicious. People down south eat it for breakfast everyday, well almost. Since I am from North part of India, I didn’t eat idli everyday so idli and dosa (crepes made with same batter) used to be those special dishes which mom made once in a while. I love south Indian food and eat it at least once a week. And I also make it at home from time to time. Last week I had this sudden urge to eat idli and since I didn’t want to wait and go through the traditional route I made these rava idli. You don’t need to ferment the batter for these and they come together pretty quickly. The semolina is roasted with few spices and then mixed with yogurt and baking soda. 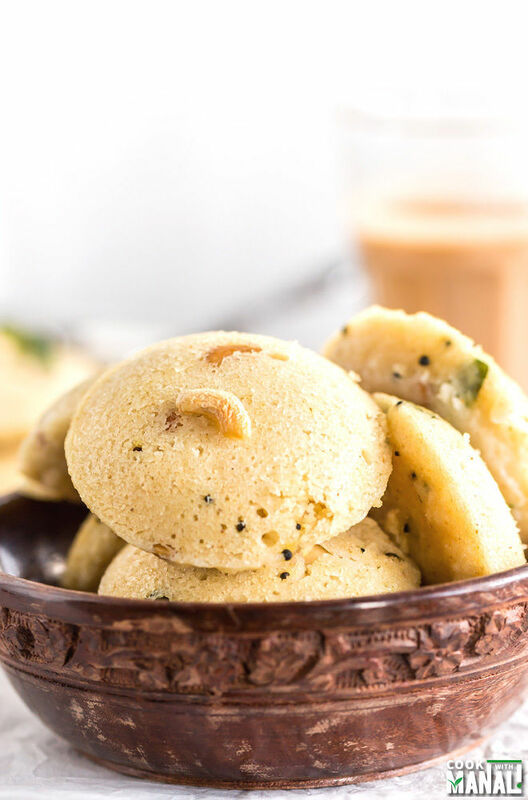 This batter is then steamed and you have the idlis ready to eat in less than an hour! That is what I love about Indian food – the variety. 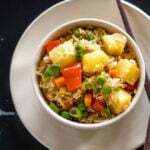 There’s so much, every state has such unique dishes which have no resemblance to the ones in other states. And I also think it’s pretty amazing what all we do with our veggies, lentils, flour and rice. Don’t you agree? 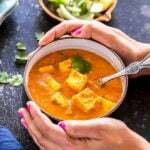 * Soak chana dal in enough water for 10-15 minutes. Drain and set aside. To a pan on medium heat add vegetable oil [or you can use ghee]. Once the oil is hot, add mustard seeds and let them pop. Once the mustard seeds pop add the curry leaves, the soaked & drained chana dal and 1 tablespoon cashews. Cook for a minute or till the cashews and the chala dal start turning light golden brown. At the point add the chopped green chili and chopped ginger. Cook for 30 seconds [you don’t really want the ginger to get all golden-brown] and add the rava (sooji) to the pan. Stir at regular intervals and roast the rava for 6-7 minutes at medium heat. You will get a nice aroma once it’s done. At the point transfer the roasted rava into a big bowl. Add the yogurt and mix. Add water and salt to make a thick batter. The batter shouldn’t be thin and it shouldn’t be very thick too. Cover the bowl and let it rest for 20 minutes. Meanwhile take a big pressure cooker (or any pan with a tight lid) and add 2 cups of water to it and let it heat on medium heat. After 20 minutes, add baking soda to the batter. You will see bubbles on the surface of the batter as the yogurt will react with baking soda. 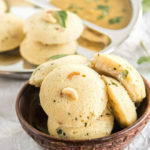 Brush your idli stand with little oil, fry the remaining 1 tablespoon of cashew in the same pan in which you roasted the rava and then place them at the bottom in each of the mould. [These cashews at the bottom are optional]. Now pour the batter on top and fill all the idli moulds of your idli stand. I was able to get 16 idlis from this batter. Stack the idli plates and place the stand inside the already heated cooker. Remove the whistle from the top and close the cooker. Steam the idlis for around 12 minutes. A knife inserted in the center should come out clean, that’s when you know they are done. Remove the stand from the cooker/steamer and let it rest for 2 minutes. Remove the rava idli from the stand and serve hot with sambar and chutney of your choice. I served mine with some cilantro mint chutney. * You can also use Eno Fruit Salt in place of baking soda. 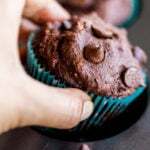 * If you do not like the little soapy taste of baking soda, then reduce the quantity to 1/4 teaspoon. * Do not add baking soda before, you have to add it just before you steam the idli. * The total prep time includes the resting time of 20 minutes. 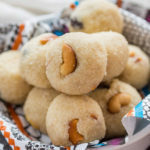 Steamed semolina cakes are a popular Indian breakfast. 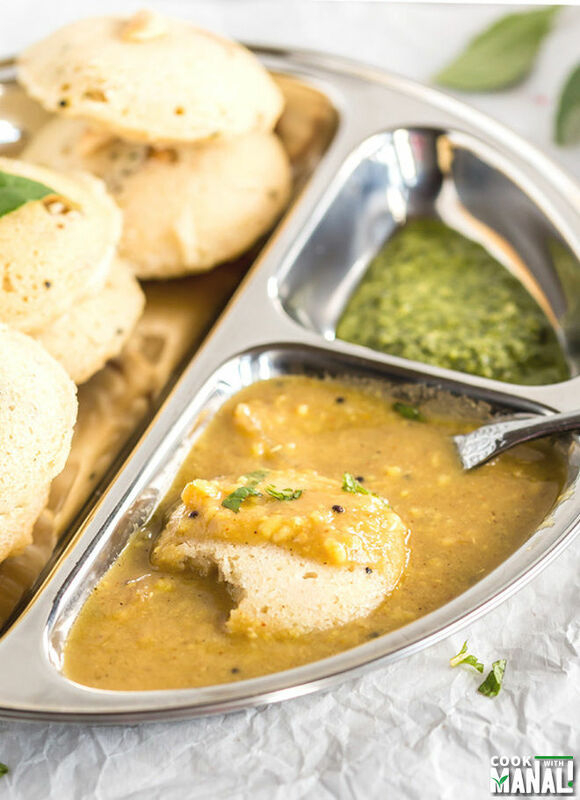 Rava Idli is best enjoyed with sambar and chutney! Soak chana dal in enough water for 10-15 minutes. Drain and set aside. To a pan on medium heat add vegetable oil and ghee. Once the oil is hot, add mustard seeds and let them pop. Cook for 30 seconds [you don't really want the ginger to get all golden-brown] and add the rava to the pan. Stir at regular intervals and roast the rava for 6-7 minutes at medium heat. You will get a nice aroma once it's done. Add water and salt to make a thick batter. The batter shouldn't be thin and it shouldn't be very thick too. Cover the bowl and let it rest for 20 minutes. Meanwhile take a big pressure cooker (or any pan with a tight lid) and add 2 cups of water to it and let it heat on medium heat. Steam the idlis for around 12 minutes. A knife inserted in the center should come out clean, that's when you know they are done. Remove the stand from the cooker/steamer and let it rest for 2 minutes. Remove the rava idli from the stand and serve hot with sambar and chutney of your choice. I guess there’s no English word for idli? They look so adorable and delicious. I don’t think there is..they are just known as idli 🙂 Thanks Angie! I usually feel recharged on Mondays, too! This breakfast looks delicious, Manali! This would definitely hit the spot today! I’m with ya, Manali. I feel charged and ready to go on Mondays…just like I feel tired (but excited) by Friday afternoon. I’m a creature of habit for sure, and I think I need to make these idli a habit. They sound delicious! haha same! I feel really tired and yet excited on Fridays! I despise Mondays, hahaha! I enjoy my lazy weekends so much that Monday depresses me. But then I go into the kitchen to bake and all is well within my soul once again. I should probably start my Mondays with this idli. I bet I bet it’s cheer me right up. It looks delicious and I bet it would cheer me right up! yay for baking!! Thanks Jen! 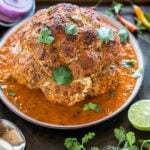 Manali, I love it when you share Indian food recipes! love learning about this one! like savory mini cakes for breakfast! love it! Oh that’s totally me too! I always wake up hungry or to be exact I wake up hungry for coffee!! These are my favorite and now I feel like having some! I wake up hungry for chai 😉 Thanks Ami! Same here! 🙂 Thanks Danielle! I like Mondays during weekdays I get little time for myself that’s why.Love these cute little rava idlis anytime. I had never before heard about idli, but it sound delicious! I will have to try it (first I will have to look for the ingredients here -_-). I agree with you, breakfast is the best meal of the whole day! Thanks Anu…you can make idli with lentils too..or broken wheat, quinoa etc. I always wake up hungry too and love the sound of these adorable mini cakes. They look delicious and perfect for chasing away those Monday blues! Ooh, I love new ideas for breakfast! I usually dread Monday’s but if I have a yummy meal like this in the morning, maybe it would change my mind, haha!